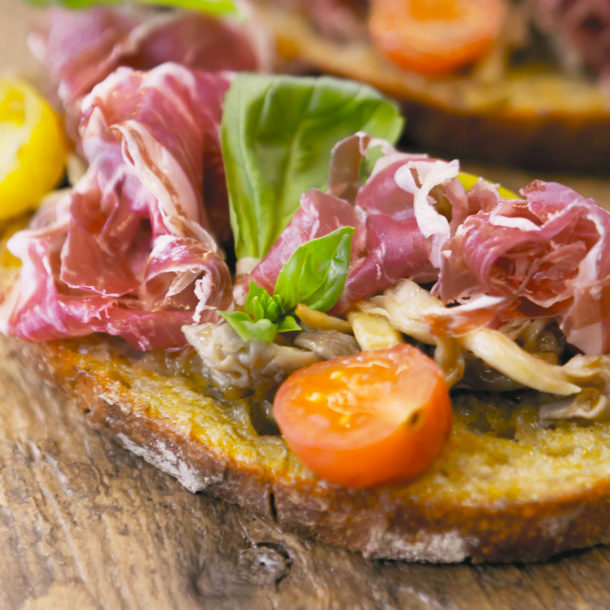 In only 10 minutes, make a pata negra toast, this high quality ham from the Iberian Peninsula.This recipe is absolutely delicious while having an aperitif with a glass of white wine or to impress your guests at the brunch’s table. 2. Shred the oyster mushroom. 3. Place the cherry tomatoes on a baking tray. Top with olive oil, a pinch of Fleur de sel and a pinch of oregano. Brush the top side of the bread slices with olive oil and arrange them on another baking tray. Put the two trays in the oven and cook for 7 minutes. 4. Meanwhile, cook the oyster mushrooms and the garlic in olive oil. Season with pepper and fleur de sel. 5. Top each piece of bread with mushrooms and few cherry tomatoes. Add a slice of pata negra, and a basil leaf on top of it. Drizzle with olive oil.